The phone has dual 5 megapixel camera at the back that allow users to create, view and share 3D content and multitask. LG has launched its first 3D smartphone, known as Optimus 3D, in India and will be available at leading retail outlets of the country from September for Rs 37,000. According to the company, this is also world's first 3D smartphone. The phone does not require any special glasses to view 3D content and is based on Android 2.3 operating system. With the LG Optimus 3D, the company has introduced a number of innovative "first" technologies including world's first 3D mobile camera to record 3D content, world's first dual-core, dual-channel and dual-memory architecture. The device will allow users to create, view and share 3D content and multitask. Vishal Chopra, business group head, mobile communications, LG India said, "The LG Optimus 3D is super-smartphone gives our consumer the pleasure of 3D without the special glasses. Its exceptional features combined with super computing capabilities will add a new dimension to the smartphone experience. The smart consumers will now have the power to create, view and share real-life 3D content and the power to explore the world of unlimited possibilities." 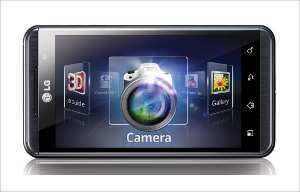 LG Optimus 3D has dual 5 megapixel camera at the back that allows users to capture and record images and videos in 3D. It has a 4.3 inch WVGA display that displays 3D content without the use of glasses. The display provides users to view 2D (up to 1080p) and 3D (up to 720p) multimedia content. LG has given a unique 3D hot key to access the device's 3D interface including gallery, camera, game & apps, YouTube 3D and 3D Guide. Captured 3D content can be shared via an HDMI 1.4 connection to 3D TVs and monitors and also is compatible with DLNA certified products. Users can also upload and stream 3D content and share each other's creations on YouTube's dedicated 3D channel (youtube.com/3D). All the normal smartphone goodies like WiFi, Bluetooth, 3G and expandable memory up to 32 GB are all present.